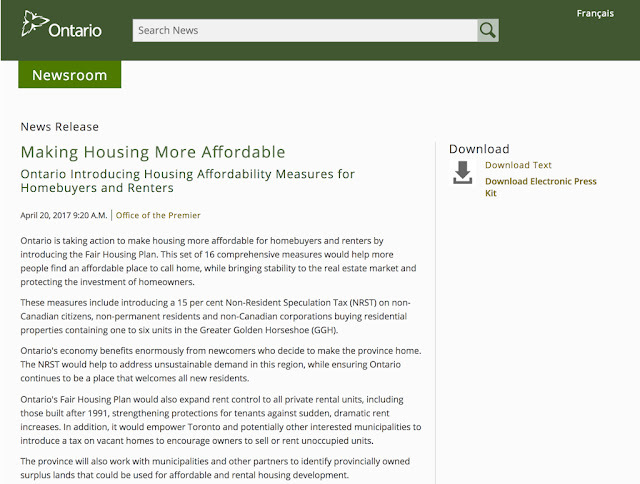 Today, Premier of Ontario Kathleen Wynne introduced Ontario's Fair Housing Plan (16 measures) to "help more people find affordable homes, increase supply, protect buyers and renters and bring stability to the real estate market. " * Non-Resident Speculation Tax (NRST) of 15% for foreign buyers of residential properties in Greater Golden Horseshoe. This is similar to British Columbia's Foreign Buyer Tax on Metro Vancouver real estate. *Almost all Ontario rentals will be capped at 2.5% per annum.